Liberia held its presidential elections on October 10, 2017, which marked the first peaceful transfer of power in the country since 1944. President Ellen Sirleaf Johnson, who has led the country coming out of a devastating civil war, is stepping down as President after her constitution-mandated two-term limit. With some 22 parties contesting for the elections on October 10th, and with more than 2 million citizens voting, Senator George Weah of the Coalition for Democratic Change (CDC) received 38% of the vote and Vice President Joseph Boakai of the ruling Unity Party (UP), came in second with 28%. The Liberian constitution requires that for the election winner to win outright, he or she must receive at least 50% of the vote, and since that did not happen, a run-off election was slated for November 7th. A number of international election observers, including representatives from the National Democratic Institute and the Carter Center, said the October 10th election was largely free and fair, despite a few irregularities at some of the polling places. On November 6th, the Liberian Supreme Court halted the presidential run-off election, which was scheduled to take place on November 7th, and thus delaying the first democratic transfer of power in the West Africa country in over 60 years. In a ruling, the court ordered the National Elections Commission to more fully investigate complaints from Charles Brumskine, the third-place finisher in the October 10th election, that the vote had been marred by widespread fraud. According to the Liberian constitution the transfer of power is scheduled for early January 2018. Given the tumultuous history of Liberia over the past several decades, it is really important that this process moves forward expeditiously as soon as possible and that the run-off elections are held. Anxiety and uncertainty amongst the populace is now growing, with concern that any extended delay will only add confusion and certainly not bode well for a peaceful transition of power. 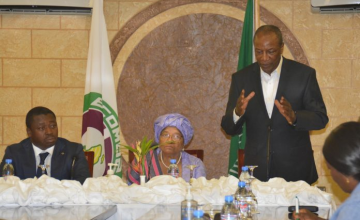 The African Union and the Economic Community of West African States are working with political parties and the government to resolve the political impasse that has gripped the Liberian nation since the release of the results of the October 10 polls. In a joint statement released in Monrovia, the Economic Commission of West Africa (ECOWAS), the African Union's liaison in Liberia, and the United Nations Mission in Liberia (UNMIL) stated, while they all support and encourage the channel of due process followed by the aggrieved parties, the National Election Commission, and the Supreme Court, they are encouraging all concerned to continue utilizing the established legal mechanisms to achieve resolution. They said the current situation is thwarting the completion of the election process before the end of the constitutional mandate in January 2018. "We wish to make it clear that the destiny of Liberia and its peace and development trajectory remain the responsibility of all Liberians, while the international community will continue to facilitate any possible assistance that may be deemed necessary to fast-track the country's development beyond the elections," the statement read. In a joint statement, the European Union Delegation to Liberia and the Embassies of EU Member States present in Liberia (France, Germany, Sweden and the United Kingdom) applauded both the Liberian people and Liberian political leaders for their political maturity with the peaceful conduct of elections including the use of legal means to address their claims and concluded " It is now the responsibility of all stakeholders to ensure that the electoral process continues in a manner which respects the will of the people, thereby putting Liberia's interests first." For sure if elections are not held before the end of the year, there will be a constitutional vacuum that will most certainly undermine democratic progress made and jeopardize peace and security in Liberia and throughout the West African Region. Furthermore, any crisis in that region will create a ground for extremism and terrorism recruitment. The country must move forward not backward, for the betterment of the Liberian people and their brothers and sisters in the region. There is too much at stake and history is watching all of us.